Because of one thing or another, we’ve been doing a lot of living off of our pantry lately. Tonight, when I had about 20 minutes to get dinner on the table, I was fresh out of ideas, and since the fridge looked pretty bare, I wondered what on earth I was going to throw together. Enter this pasta to save the day (yet again). The fact is, I’ve been making this pasta for years and years. I discovered it way back in our super poor newlywed days (when we went about a month and a half with neither of us getting a paycheck and we were seriously scraping meals together), and I’ve been making it ever since, especially when we’re out of seemingly everything else (including meat) and I’m running low on time and/or energy. In other words, this is the perfect pasta recipe to have on hand when you don’t have a lot in your fridge, don’t have a lot of time on your hands, and don’t want to spend a whole lot of time cooking. Plus, it tastes pretty good, too (naturally). Anyway, I highly encourage you to pin this recipe so that the next time you find yourself in a crunch and need something fast that’s made up of staples you will likely have on hand, you’ll know just what to do. 1. Salt a medium-large pot of water and bring to boil. Cook pasta according to directions. 2. While pasta is cooking, melt butter in a saucepan. Stir in the oil, flour, garlic, and seasonings until blended (and, if cooking with fresh garlic, until the garlic is fragrant, about 30 seconds). 3. Gradually add the milk, broth, and water. 4. Bring to a slow boil; cook and stir for about two minutes or until thickened. 5. Remove sauce from heat; stir in cheese and sour cream (if using). 6. Drain pasta; toss with sauce. 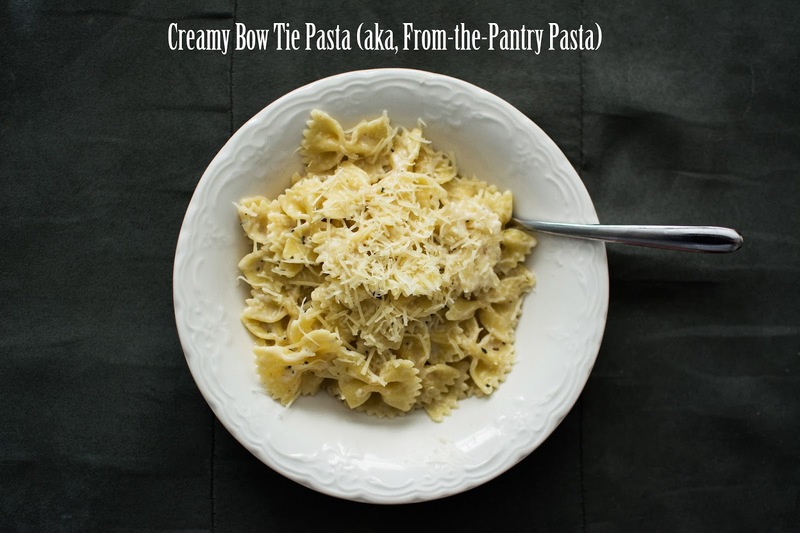 *If you need to make this recipe stretch a few more servings, you can add the whole 16-ounce package of bow tie pasta and just reserve some of the pasta water (rather than draining it all) and add that to the sauce to make it go further. *If you want the sauce to be creamier, substitute milk for the water. If you want it to have a slightly stronger chicken flavor, you could substitute chicken broth for the water. Also, although I haven’t tried it, I’m sure you could easily make this full-on vegetarian by just using vegetable broth. *If you have chicken, it goes great with this recipe. Just cook up a breast or two, shred it, and add it in. *In a pinch, I’ve used other kinds of cheese besides Parmesan, though that’s easily my favorite. *This is made more delicious with the addition of the sour cream or heavy cream or even whole milk at the end, but if you don’t have any of those things, it still tastes great without. *I like to serve this with roasted broccoli or green beans, and I’ve been wanting to try it with peas in it for awhile (and just boiling them with the pasta for the last two or three minutes or so). Really, this is a highly adaptable recipe that can easily mold well to many variations.